I always like finding great first-time writers (can’t imagine why ;) ). Anyway, here’s a new one I just found that turned out to be really good. THE SECOND TRUMPET by Larry Miles. In the wake of the 9/11 attacks, the question that lingers in the mind of every American is not if it will happen again, but when. As terrorists stand ready to decapitate the U.S. government with a nuclear suitcase bomb deep in the nations capital, Colin Calhoun, a wealthy businessman with no use for God, finds himself in jail fighting for his life. Meanwhile, Sam Morgan, a devoted believer, struggles to make sense of the enigmatic visions hes receiving from God. 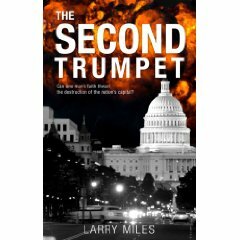 Author Larry Miles weaves an intricate web of prophesy and destiny as two men at the core of Gods end-times plan for America race against time to decode divine messages before The Second Trumpet sounds. It’s one of those fast paced novels that reminds us all that we live in a dangerous world that could cause us to live in fear and doubt. Larry Miles does a great job of developing characters that provoke the reader to evaluate their own relationship with God and how He is working out His plan for mankind. If you have ever found yourself fearful of terrorist attacks this novel will keep you turning the pages to not only find out what happens, but to set you straight on how to overcome that fear.